They stand like so many wizened wooden sentinels, this grove of gnarled olive trees, consisting far more of trunks than of branches. Some of these trees are 900 years old, faithful successors to those which filled this hillside when Jesus walked its dusty slopes. They are not the very trees he saw, for Titus cut all those when he destroyed Jerusalem in A.D. 69-70, but they are the same kind of trees which once shaded Jesus. We do not know the precise location where Jesus prayed in agony on the night of his betrayal, but it was within a stone’s throw of our outdoor devotional this day. 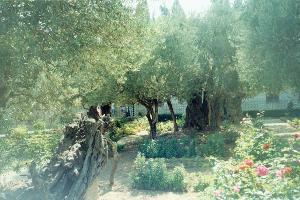 For this garden is Gethsemane — an Aramaic word loosely translated as “the place of the wine press” — and here the Savior also was pressed in spirit, “very distressed and troubled, deeply grieved to the point of death,” until his sweat fell like great drops of blood to the ground (Mark 14:32-34; Luke 22:44). We are on the Mount of Olives, where Jesus came with his disciples, Judas excepted, after giving sacrificial meaning to the ancient staples of Passover bread and wine. We are not far outside the city wall, just east of the Kidron ravine which in winter becomes also a stream. Our hotel is a 20-minute walk above us, cresting the Mount of Olives. Behind our hotel spreads the village of Bethany, barely 1-5/8 miles from Jerusalem’s westward walls. 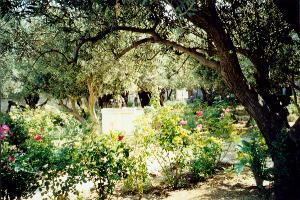 Jesus came often to this Mount of Olives (Luke 22:39). This time he came to underscore his commitment to the Father’s purpose before receiving the “cup” of divine judgment. Then Jesus drank that “cup,” so that those he saved would not have to drink it for themselves. We drink the eucharistic “cup of blessing” instead, which Jesus called “the new covenant in my blood” (1 Cor. 10:16; Luke 22:20). “If it is possible,” the Savior prayed that night here in Gethsemane, “let this cup pass from me; yet not as I will, but as Thou wilt” (Matt. 15:39). God heard Jesus’ prayer in the Garden, and he answered it because of Jesus’ entirely obedient life (Heb. 5:7) — raising him back out of death after Jesus had quaffed the judgment “cup” by dying as a substitute for and as a representative of all who finally will be saved. Doing so, the Father took the judgment “cup” back from his Beloved Son — prophetic imagery symbolizing restoration following God’s judgment (Isaiah 51:22) — just as Jesus had requested. The “cup” came to Jesus, and he trusted the Father enough to drink it, then it passed from his hand back to God’s. We walk down the winding, narrow street from the top of the Mount of Olives, retracing the path of Jesus on the night of his betrayal as pilgrims have done for centuries. 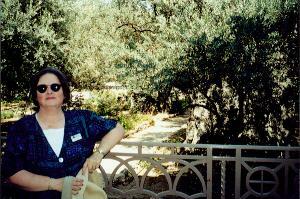 Through an arched wall opening, we enter the garden of Gethsemane, a pleasant place of beauty and serenity filled with rose bushes and blooming flowers planted amidst ancient olive trees. These trees perhaps are descended from those very trees which witnessed our Lord’s prayers, on a night far removed from serenity or beauty. Inside the Church of all Nations, also called the Church of the Agony, a large ledge of rock draws our attention. No gilded trappings, no golden overlay, this rock in its elemental simplicity stirs such powerful emotions and evokes such strong mental images. Perhaps Jesus flung himself here, prostrate before the presence of his Father. Hard and unyielding, this stone may have felt his tears, may have stung his knees as he knelt here in the dark, alone, forsaken by his sleeping frail followers, fearful of the treatment that was sure to come, dreading the ultimate pain and agonies of the cross. Perhaps even fearful that his Father was not hearing his cries in the night. There was real suffering here on that night; real tears soaked this ground. These craggy olive trees and this stone symbolize those rugged hours ahead of him, the suffering Savior praying alone, grieving a bitter cup which he would drink for you and for me. How unworthy I am of such a precious sacrifice. How incredible was his love for me and for you. Hallelujah! What a Savior!